As I had mentioned earlier, Konkanis make many different sarus which are like rasams. These are very quick to make, so they are very suitable when you want to cook something tasty very fast. This is such a saru which has very few ingredients. My mother and grand mother used to make these kind of sarus. This is my son in law’s favorite and on his request, I am posting this. This can be served as a soup on its own or served with rice. Heat oil and add mustard seeds. When they start popping, add curry leaves, green chillies, turmeric, asafoetida.Â Fry for a min and add water. When it starts boiling, add salt, jaggery, coconut and boil for another 1min. 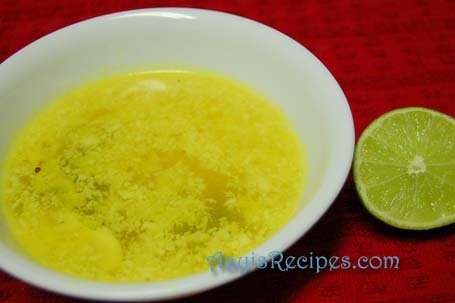 Add lemon juice and take off the heat. Garnish with coriander leaves (optional, I did not use it). i should have guessed that the coconut would be what makes it specifically konkani….lovely recipe……loved your kale vatanyachi curry. we make it slightly differently at home. Dear Aunty, this is one of the most refreshing soups ever! Thank you so much for sharing this. Varadpacchey, saaru kasane chanda color, ruchiii dista! wow! how quick n easy is that! thank you aunty! Vardpachi colour bhari layeke dista!!! I think it is also called Udka Saru, (coz dal is not used) not sure though. Good to slurp down as a soup. This new to me.Sounds simple..
what a delicious looking saaru, gorgeous in its simplicity. I was just waiting to lay my hands on this recipe…Finally I got this one.